Personally, I think they’re the best investment as there are so many possibilities. Narrowing down the detail you like is the hard part! If you need a bit of inspiration for how to style your hair vine, you may find this post helpful - it has examples with pictures which will hopefully give you a few ideas of how you could wear yours. Today though, I want to look at the practical elements of wearing a hair vine. Specifically, how exactly do you put it in your hair? It’s a good question, actually and you’re certainly not alone if you’ve been wondering how they stay in your hair. There are a few things you can do to get your hair “hair vine ready”. Any hairdresser will advise you not to wash your hair the day of your wedding so that it is easier to work with and more likely to hold the style all day. When it comes to keeping accessories in your hair, hair spray and dry shampoo work miracles. They make your hair feel thicker and add texture, helping the grips and pins to stay in place. Spritz your hair with some spray or rub in a little dry shampoo at the roots. Backcomb gently and then fasten your hair piece in. To match their versatility, there are a few ways that you could attach your hair vine. Let’s start with the easiest and most straightforward first! Your hair vine will have a small loop at either end and possibly even a loop on other details if your piece is quite large. To fasten your hair vine in place, you will just need a few hair grips that match your hair colour. Place your hair vine where you’d like it in your hair (I find an extra pair of hands is really helpful here!) and then secure it in place by sliding the wire of the loop through the hair grip, catching your hair as you go. Another nice solution if you’re planning on wearing your hair vine like a hair band or across your forehead is to attach ribbons to the loops and tie it in place. This looks lovely with relaxed styles; you could even make your ribbons using some of the silk or satin offcuts from your dress to tie it all in. Just because the loops are there doesn’t mean you have to use them. Instead, you could ask for your vine to be attached to metal hair pins or slides that snap shut. The metal hair pins I use on some of my vines have long “legs” (see the picture of Laura’s bespoke piece below!) and hold the vine well in thick or long hair. They’re also a good idea if you have heavy detailing in the middle as they anchor the central feature in place. 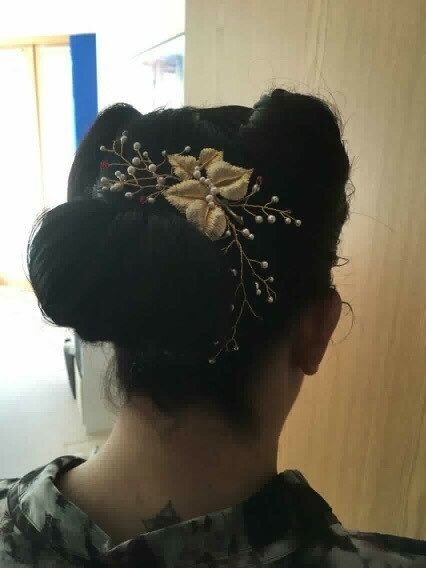 I always recommend adding a pin to the back when I design pieces around brooches as it helps them to feel more secure in your hair. Laura’s hair vine (above and left) featured a vintage brooch and delicate vines of pearls and red Swarovski crystals. The gold hair pin secured the heavier brooch detail in place. Likewise with hair slides, they help your hair piece to feel more secure as they grip more strands of hair when they close. You can also buy them in a colour that is similar to your hair colour so that they blend in easily. My final solution is to attach a small hair comb to either end of your vine. Again, this will help your vine to feel more secure. I personally find the combs with flat “teeth” hold better in my hair, but the ones with the twisted legs will work equally well - you can also push a hair grip between the gaps of the legs for added stability!